Located on the 6th floor of a Mini Cooper showroom (and renovated in late 2010), Fuzio has a nice low rise view of the Ekkamai area with outdoor seating options. 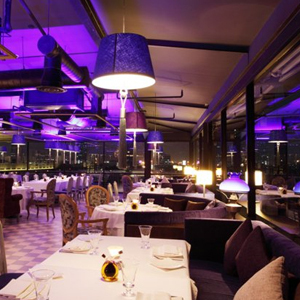 The food is modern Italian fine dining, with influences from France and Asian countries. Fuzio also serves premium Blackmore Wagyu Beef. You'll get top quality and spectacular dishes, but take note that all this goes into the bill. Tip: come during lunch time Monday-Friday for their set menu at THB 550 net. per person, and have a 2 course menu at the price of an a la carte main. Take a taxi down Ekkamai, between soi 5 and 6 is the Mini Cooper Showroom. Fuzio is on the 6th Floor.